Political hype and drama have certainly ramped up since Duterte's recent change of heart! After a lot of pabebe-ing soul-searching, our iron-fisted mayor from Davao finally confirmed that he is running for president in the 2016 elections. How? We’re not really sure since several parties are currently saying substituting Davao City Mayor Rodrigo Duterte for PDP-Laban's original standard-bearer Martin Diño is against filing procedures…but let’s not get ahead of ourselves; that topic deserves a separate discussion. A lot of people have been saying loads regarding Duterte's change of heart and, as you may have predicted, shots have been fired. Before Duterte's supporters rejoice at their bet's decision to finally run, veteran election lawyer Romulo Macalintal reminds them that there are a few legal obstacles that he must first recognize. Foremost is the fact that the guy he is substituting for (Diño) might be considered a nuisance candidate, which renders the filing of his certificate of candidacy (COC) void ab initio. But according to another lawyer, former Commission on Elections Chairman Sixto Brillantes, Duterte is A-okay to run because "The grounds in fielding a substitute are death, disqualification, and withdrawal. Diño withdrew, so he can be replaced. Why will the party be made to suffer? They nominated one candidate and he withdrew, so why can't the party replace him?" For the most part, it seems like it’s Duterte versus the world, but it seems like his bro for life, Sen. Alan Peter Cayetano, won’t be leaving him hanging just yet. Mr. Cayetano countered Sen. Chiz Escudero’s accusation that Duterte was just using Poe’s nationality issue as an excuse to run. He even had a few words of comparison for their tandem. "Kung gusto ninyo ng drama at pagkukunwari, nandiyan ang Poe-Escudero. Kung gusto ninyo ng matapang na solusyon at mabilis na aksyon, nandito po ang Duterte-Cayetano. Basta kami, we will not cheapen the presidency," Cayetano said. Shots fired, indeed. 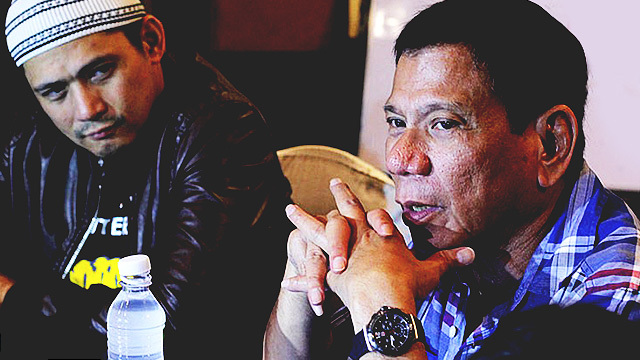 Echoing Cayetano's sentiments, Duterte's son, Davao City Vice Mayor Paolo Duterte, said that Sen. Escudero should know Poe shouldn't be allowed to run since she "cannot be considered a natural-born Filipino citizen and does not satisfy the residency requirement." He then boldly accused in his Facebook post, "Who’s now using who?" The vice mayor seems to have inherited his father’s ballsy attitude. We've always felt Liberal Party standard bearer Mar Roxas' campaign jingle ought to be something along the lines of "I Just Can't Wait To Be King," from The Lion King. There's probably only one person who wants Mar Roxas to be president more than Mar Roxas himself, and that's his wife, Korina Sanchez. So we can't blame him for playing safe with this statement: "Without any specificity, all of us do not want a foreigner to become the president, right?" Oh please do tell us who you're talking about, Mar. Another guy who wants to play in the gray area and keep a semi-neutral stance is presidential spokesman Edwin Lacierda. With the statement, "Let's move the discussion from one of personalities to one of issues-based and that’s where the President wants the whole campaign to be. Let’s talk about issues, let’s talk about your program of government," Lacierda tries to veer away from the drama. While all this is happening, the prez was finally doing some damage control with the Lumads, two months after the news of the killings were made public. Concerned Cabinet members also attended the meeting to discuss the issue. After six whole years there hasn't been any real movement in the case for the 58 people killed in the Maguindanao massacre. After hundreds of witnesses and thousands of documented evidence were presented, progress was still next to none. To whoever wins, this will be on your plate so we sincerely hope you’re up for the task. With all the politics and passive-aggressiveness going on between the presidentiables, at least one guy is just genuinely happy about Duterte's decision. Fellow badass, Robin Padilla told PEP.ph, "Nagpa-party si Mariel (Rodriguez, his wife and former FHM Cover Girl), meron siyang cake at tinanong nya ako, 'Anong birthday wish mo?' Sabi ko sana, kumandidato at maging presidente si Duterte." Well, happy birthday, idol! We really wonder what Mayor Duterte's stance is regarding significant political issues; too bad it looks like he won't participate in the scheduled presidential debates. Yes, the manly mayor of Davao doesn't actually want to debate with other presidentiables because he says, "Ayokong makipag-debate sa kanila... Debate debate. Wala namang mangyayari." He says he's already satisfied with letting his platform do the talking. But if push comes to shove? "Pero kung pipilitin nila ako, okay lang. We'll talk about everything under the sun." We don't know about you but we would love to watch things heat up in the presidential debates. Seriously, it's one of those venues that can help the electorate make a sound decision come voting time. Be sure to catch the presidential debates on these (tentative) dates: Feb. 21, 2016 in Mindanao, March 20, 2016 in Visayas, and April 24, 2016 in Luzon. We know we will.